Structural analysis programs by Dlubal Software integrate seamlessly into the planning according to the method of Building Information Modeling (BIM). 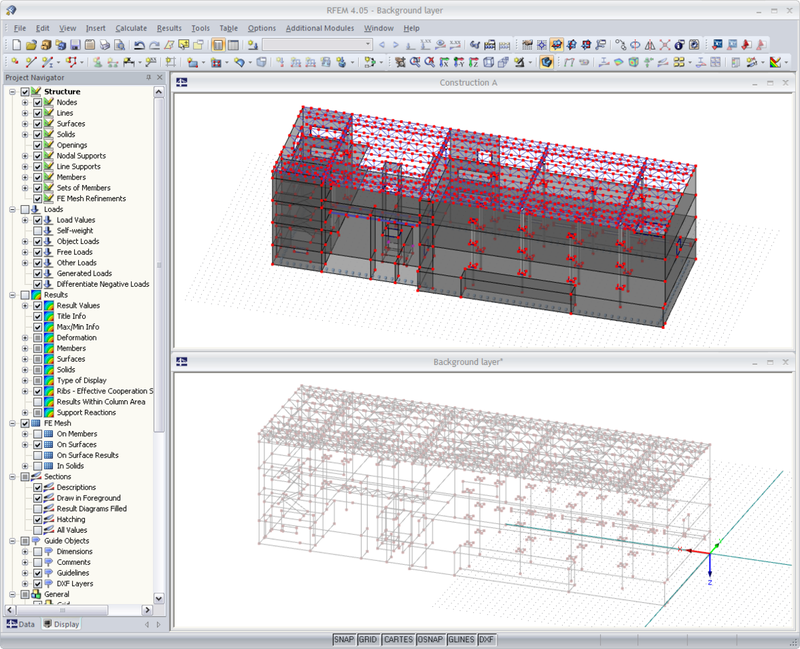 The large number of interfaces ensure the data exchange of digital building models with RFEM or RSTAB. Layers are used for targeted modeling - in contrast to the direct DXF import of a structure where the entire model is transferred as converted nodes, lines, members, and surfaces. It is possible to use any number of layers in one structure. The background layers can be transferred to RFEM/RSTAB and also adjusted or created there. Before the import, it is necessary to check the conversion settings: In CAD programs, the global Z-axis is usually directed upwards. In RFEM, however, the Z-axis is directed downwards. So it is necessary to adjust the direction of the Z-axis for the import reasons. In addition, the length units can be adjusted as well. Optionally, it is possible to specify an offset in order to shift the layer in RFEM. 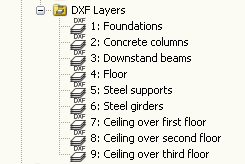 In the case of DXF files, a particular layer can be selected from the list of layers. The imported layer appears in gray in the workspace: The gray line model enables the input of nodes, lines, and members. The individual layer points can be selected using the object snap. It is possible to edit each background layer using the functions Move, Rotate, Mirror or Stretch. The DXF file format transfers only the general properties of lines used in the model. One layer is used for each cross-section. It is not possible to transfer nodal supports, loads, and so on. There are several setting options available for the export of an RFEM structure as a line model. 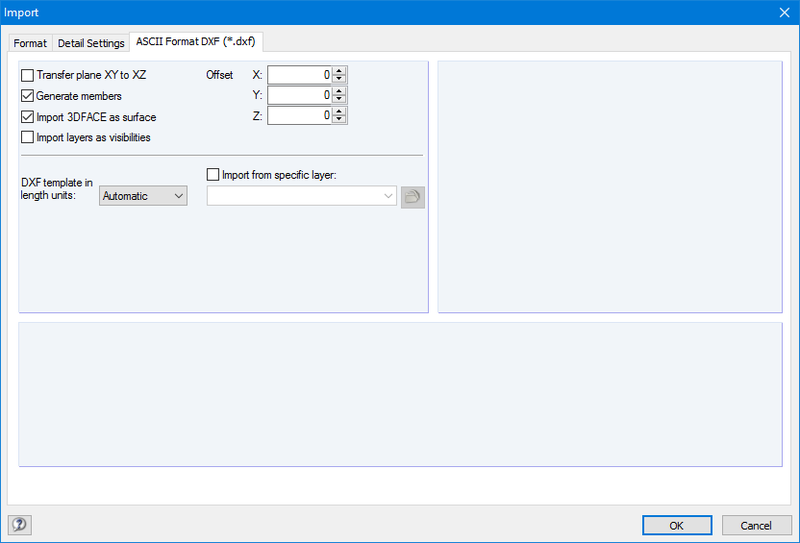 In RFEM and RSTAB, it is possible to import DXF files as background layers. They can have one to three dimensions. For this, you can use DXF files from other programs as well as the DXF files exported from RFEM or RSTAB. In RFEM and RSTAB, you can import background layers from a DXF file. If the main nodes of the model have already been set, it can be useful to deactivate the snap mode of the background layer.